Scrap Shotz Snap Shotz: December Monthly Kit with Karla! Hello! It's Karla here today with a layout using the fabulous new Scrap Shotz December Monthly Kit, featuring the Carta Bella Cabin Fever collection. I am truly amazed at everything in this kit as well as the add-on's available, and I can't wait to share it with you!! I'm using the fabulous sketch from the Creative Scrapbooker Magazine Sketchy Challenge as inspiration for my layout. I used an older circle cutting system in my stash to cut out patterned paper circles, but you could grab some plates, cups, or anything circular! The epoxy stickers in the kit are gorgeous. I love how they are semi-translucent and have such a cool feel! There are a package that comes with the kit as well as some epoxy words, which are a lovely add-on! The beautiful sweater print and plaid papers in this collection are just so perfect to scrap all your winter pics, and I love how well they all coordinate together! I really had fun with the rub-ons (an add-on available!! ), which transferred beautifully to the Bazzill cardstock in the kit. I used mitts and snowflakes around the page and the Oh What Fun sentiment. The sticker sheet as well is fabulous and has tons of really amazing stickers - perfect for scrapbooking or cards! The red and white sweater print border is so lovely, and the full patterned sheet of cut apart borders are a quick and easy addition to a page. I really enjoyed layering all the fun elements included in this kit, and I can't wait to create a lot more!! And be sure to check out this video for a close up of all the beautiful supplies in this month's Kit Club!! 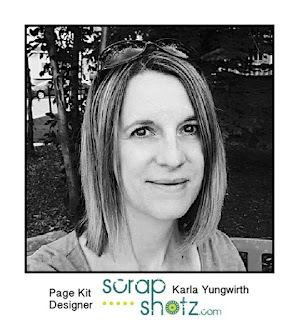 Be sure to check out the Scrap Shotz store to order and subscribe to this amazing monthly kit club, and follow the blog here all month long as we bring you lots of projects and inspiration using it! Thanks so much for stopping by, and I hope you have a wonderful week ahead! Great layout and thanks for the amazing process video! !